Hyundai Genesis Coupe R-Spec: Live! Hot on the heels of Genesis Coupe pricing, Hyundai also revealed their trimmed-down Hyundai Genesis Coupe R-Spec, a lighter, stiffer, cheaper choice with lots of fun go-fast parts. The R-Spec brings a lot to the table by bringing less, targeted at the track day and tuner crowd who will be modifying their cars to start, so no Bluetooth stuff, no automatic headlights, cruise control, chrome trim, steering wheel buttons, and other nonessential doo-dads. It does keep all the good stuff though — four pot Brembos, Torsen limited slip differential, six speed manual and Bridgestone Potenza's wrapped around 19 inch gunmetal gray wheels. It also gets a more aggressive tune on the traction control system, 7% stiffer front springs and 15% stiffer rears, retuned dampers and thicker anti-roll bars. 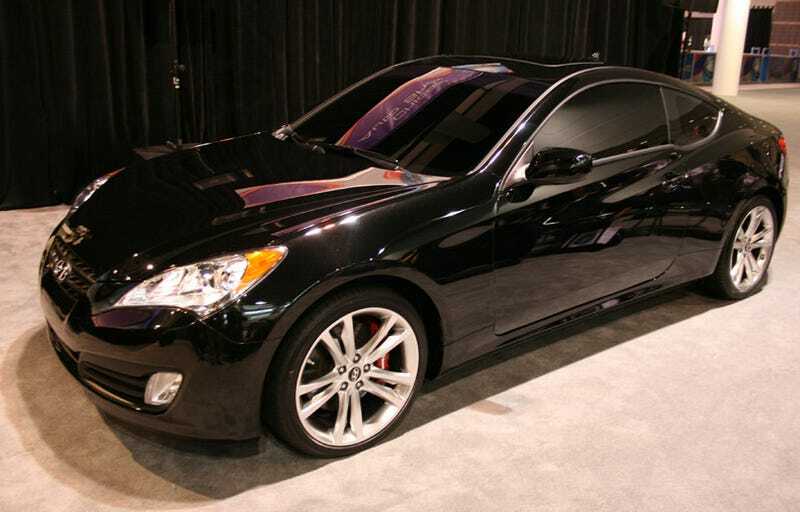 Basically this is the Genesis Coupe we would be optioning were we in the market for one. Considering the price starts at $23,750, its going to be the darling of every high school parking lot. CHICAGO, Feb. 11, 2009 – When the colors of your new turbocharged rear-wheel-drive sport coupe are named after international racing circuits, you'd better have the performance and confidence to back it up. Now, Hyundai is upping the ante by announcing an R-Spec version of the all-new 2010 Genesis Coupe, designed to appeal to true enthusiasts who want a low starting price and the ability to tune their car to their own specifications. R-Spec will be available as a mid-2010 model year introduction. R-Spec provides genuine track-readiness in an affordable model. The R-Spec adds core performance equipment to the most affordable 2.0T model, such as: Track-tuned suspension, 19-inch gunmetal-finish alloy wheels with performance summer tires, Brembo® braking system, Torsen limited-slip differential, and R-Spec badging. To further reduce cost and weight, it also eliminates some non-essential convenience equipment such as: Bluetooth®, automatic headlights, cruise control, trip computer, chrome interior accents and steering wheel audio controls. The Genesis Coupe R-Spec will be priced at $23,750 and $3,000 less than the 2.0T Track model, leaving tuners with extra cash for their own choice of aftermarket performance upgrades. Appropriately, the R-Spec will be available in three performance oriented exteriors colors: Karussell White, Bathurst Black and Tsukuba Red.